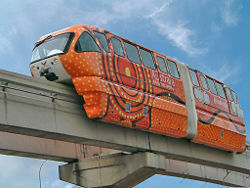 The KL Monorail in Kuala Lumpur, a colorful straddle-beam monorail. A monorail is a single rail serving as a track for passenger or freight vehicles. In most cases, the rail is elevated, but monorails can also run at grade, below grade, or in subway tunnels. The vehicles are either suspended from, or straddled on, a narrow guideway. Monorail vehicles are wider than the guideway that supports them. Compared to conventional rail systems, monorails require less space, both horizontally and vertically. Monorail systems are commonly elevated, requiring a minimal footprint for support pillars, blocking less of the sky. In addition, modern monorails are quieter because they have rubber wheels on a concrete track, and they are capable of climbing and descending steeper grades than heavy or light rail systems. Monorails have an excellent safety record, but emergency evacuations may take time if the system is not equipped with emergency walkways or aircraft-style emergency chutes. Gyroscopically Balanced Monorail (1907) by Brennan and Scherl. Attempts at creating unconventional railways have been made since the latter part of the nineteenth century. Usually these have been claimed to be more efficient, faster, or cheaper to construct than conventional railways. Several attempts have been made to create a system in which a double-flanged steel wheel operates on a single rail similar to the railroad type of rail. 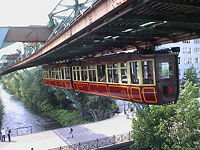 The Wuppertal monorail described below is the only surviving monorail of this type. Monorails have both benefited and suffered from their novelty and image of modernity. When The Walt Disney Company placed a monorail in their Disneyland theme park in 1959, it exposed large numbers of visitors to the transportation form in a credible, though miniature, transit setting. At the same time, however, the public's association of Disney to the monorail led to the image of monorails being nothing more than a theme park ride. The popular press in the U.S. during the mid twentieth century often featured monorail ideas in a "transportation of the future" context, along with images of personal "rocket backpacks" and popular space travel, creating interest but also confusion as to which ideas were fads and which might become reality. The Schwebebahn Wuppertal, the world's first suspended monorail. Modern monorails depend on a large solid beam as the vehicle running surface. There are a number of competing designs divided into two broad classes, "straddle-beam" and "suspended" monorails. 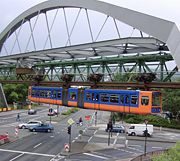 The most common type of monorail in use today is the straddle-beam, in which the train straddles a reinforced concrete beam in the range of two to three feet (ft) (~0.6-0.9 meters (m)) wide. A rubber-tired carriage contacts the beam on the top and both sides for traction and to stabilize the vehicle. The straddle-beam style was popularized by the German company ALWEG. 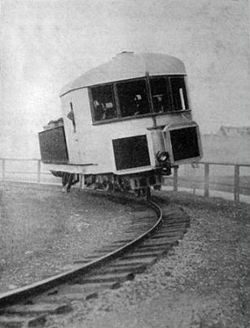 There is also a form of suspended monorail developed by the French company SAFEGE in which the train cars are suspended beneath the wheel carriage. In this design the carriage wheels ride inside the single beam. Almost all modern monorails are powered by electric motors fed by dual third rails, contact wires, or electrified channels attached to or enclosed in their guidance beams. There is a startup called Metrail that has built a hybrid prototype using diesel power to generate electricity for the motors. Transrapid maglev on monorail track. Magnetic levitation train (maglev) systems by the German Transrapid were built as straddle-type monorails, as they are highly stable and allow rapid deceleration from great speed. During full-speed operation, maglev trains hover over the track and are thus not in physical contact with it. It is the fastest monorail, running at up to 311 miles per hour (mph) (501 kilometers per hour (km/h)). Some early monorail systems—notably the suspended monorail of Wuppertal (Germany), dating from 1901 and still in operation—have a design that makes it difficult to switch from one line to another. Some other monorail systems avoid switching as much as possible, by operating in a continuous loop or between two fixed stations, as in Seattle, Washington. Sydney's monorail avoids switching by operating in a single loop. Current operating monorails are capable of more efficient switching than in the past. In the case of suspended monorails, switching may be accomplished by moving flanges inside the beamway to shift trains to one line or another. Straddle-beam monorails require that the beam structure itself be moved to accomplish switching, which originally was an almost prohibitively ponderous procedure. Now, however, the most common way of achieving this is to place a moving apparatus on top of a sturdy platform capable of bearing the weight of vehicles, beams, and its own mechanism. Multiple-segmented beams move into place on rollers to smoothly align one beam with another to send the train in its desired direction, with the design originally developed by ALWEG capable of completing a switch in 12 seconds.. Some of these beam turnouts are quite elaborate, capable of switching between several beams or even simulating a railroad double-crossover. In cases where it must be possible to move a monorail train from one beam to any of a number of other beams, as in storage or repair shops, a traveling beam not unlike a railroad transfer table may be employed. A single beam, at least long enough to carry a single monorail vehicle, is aligned at an entry beam to be mounted by the monorail cars. The entire beam then rolls with the vehicle to align with the desired storage beam. The term "monorail" is often applied by members of the public to any modern elevated railway, particularly automated ones such as the Docklands Light Railway, Vancouver SkyTrain, and the JFK AirTrain. This usage, however, is erroneous because these systems use the same twin rails and electric third rail as most underground metros and some main-line railways. The primary advantage of monorails over conventional rail systems is that they require minimal space, both horizontally and vertically. Monorail vehicles are wider than the beam, and monorail systems are commonly elevated, requiring only a minimal footprint for support pillars. Due to a smaller footprint they are seen as more attractive than conventional elevated rail lines and block only a minimal amount of sky. Monorails are capable of climbing and descending steeper grades than heavy or light rail systems. Unlike conventional rail systems, straddle monorails wrap around their track and are thus not physically capable of derailing, unless the track itself suffers a catastrophic failure, which is why monorails have an excellent safety record. In an emergency, passengers may not be able to immediately exit because the monorail vehicle is high above ground and not all systems have emergency walkways. The passengers must sometimes wait until a rescue train, fire engine, or cherry picker comes to the rescue. Newer monorail systems resolve this by building emergency walkways alongside the entire track, at the expense of visual intrusion. Suspended railways resolve this by building aircraft style evacuation slides into the vehicles. Japanese systems are set up to use the next train to tow broken-down trains to the next station. Adding extensions by diverging the track is more expensive because of the linear nature of the track itself. ↑ The Monorail Society, What is a Monorail? The Monorail Society. Retrieved July 18, 2007. ↑ Michael Cabanatuan, Finally, the future is now for monorails. Retrieved July 18, 2007. ↑ Kim Pedersen, The Switch Myth The Monorail Society. Retrieved July 18, 2007. Botzow, Herman S. D. 1960. Monorails. New York: Simmons-Boardman Pub. Corp.
Las Vegas Monorail: Troublesome Technology in a Unique "Niche" Application - a critical article on the Las Vegas Monorail. Monorail Capital Costs: Reality Check - a critical article on the capitial costs of monorails. Monorails, Light Rail, and Automated vs. Non-Automated Transit Operation: Comparative Costs in Japan and USA - a critical article on the cost differences of monorails, whether they are automated or not. This page was last modified on 18 October 2018, at 16:56.